KUALA LUMPUR, April 12th, 2019 – Road traffic can be a bane when it comes to commuting daily into Kuala Lumpur. While the convenience of the new MRT transport infrastructure around in Greater KL has improved mobility, it cannot be denied that many of us are still heavily reliant on cars. Being the main arterial road linking one of Kuala Lumpur‘s busiest districts to suburbs to the north and south of the city, Jalan Tun Razak faces a prevalent issue daily. Traffic congestion, caused by interchanges in this area, can get unbearable for daily commuters especially during rainy seasons and is expected to worsen once the TRX City development is fully functional. There was a study in 2015 conducted by the World Bank which revealed that Greater Kuala Lumpur residents collectively spend a whopping 250 million hours stuck in traffic in a year. That is a worrying figure, and jeopardises quality time at home where it matters more. 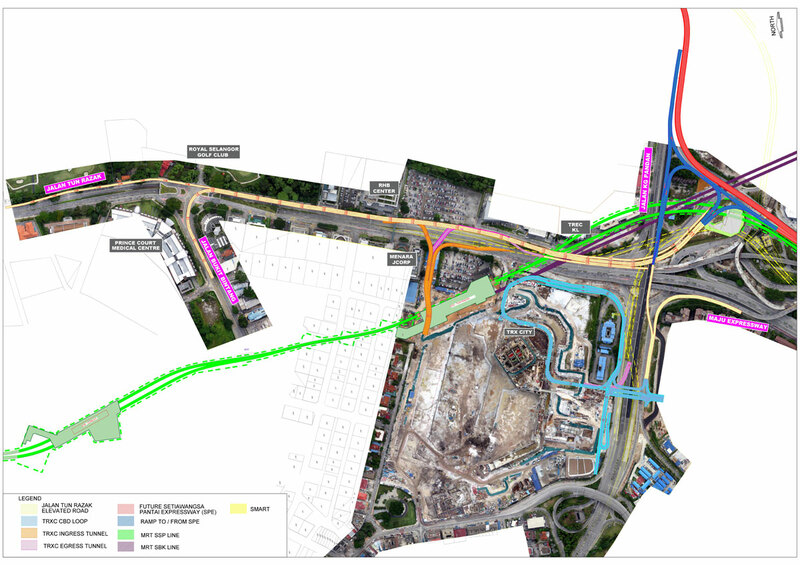 Due to these ongoing congestion issues, Dewan Bandaraya Kuala Lumpur (DBKL) has taken the initiative to implement the TRX External Roads in a bid to ease the current traffic conditions along Jalan Tun Razak while also facilitating effective traffic dispersal from the future TRX City and incoming traffic from Bukit Bintang and Kampung Pandan. Frequent commuters who reside on the outskirts of Kuala Lumpur or within Klang Valley will soon enjoy improved road traffic conditions as the new Tun Razak External Roads is erected by first quarter of 2020. The project is currently close to 50% completed. Naza Engineering & Construction (Naza EC) Sdn Bhd, a subsidiary of private-held Bumiputera conglomerate Naza Group of Companies, bid for and won the tender for best Design & Build in infrastructure plan to construct the 2.5km elevated roadway that will complement the existing number of lanes on Jalan Tun Razak, which is a prime exit point from the city centre. The project by Naza EC will support current traffic flow and accommodate the growing vehicle population along Jalan Tun Razak, such as when the nearby TRX City is completed and fully operational. The first approach single-lane ramp starts near Jalan Langgak Golf picking up traffic heading towards Bulatan Kampung Pandan and merges with the Jalan Bukit Bintang two-lane ramp which starts near Jalan Delima before the Jalan Tun Razak-Jalan Bukit Bintang intersection to become a three-lane carriageway section forming the mainline of the external road. Another ingress ramp connects to the multi-level roadway from TRX City. The ramps will then connect motorists to Bulatan Kampung Pandan, Maju Expressway (MEX) and Setiawangsa Pantai Expressway (SPE) north-bound and south-bound via separate ramps. An additional two ramps are underway to connect Jalan Kampung Pandan overpass and MEX towards the south entrance of TRX City. The TRX External Roads is a long-term solution by DBKL to the state of traffic congestion that motorists currently face on a daily basis along Jalan Tun Razak and the surrounding roads. Once the traffic dispersal project is completed, it is predicted to accommodate up to 48,000 vehicles daily during peak hours, according to the Traffic Impact Assessment (TIA).